Your quest list should be getting a little confused. Most of your current quests should be for Un'goro, the Plaguelands, or Winterspring. You'll also need to visit some folks in Stormwind, a have a morrowgrain quest to deliver to Darnassus. And finally you have a quest from Ironforge to collect some oozes in Felwood. From Astranaar, ride down the road until you can take it north into Felwood. When you reach the Emerald Sanctuary, scope out the quests there, as well as the flight point. You'll find Grazle across the road looking for allies to the Timbermaw Clan of furbolgs. And slightly back down the road and to the east is a druid, Arathandris Silversky, with one more quest. There are a lot of corrupted plants throughout the zone, and her quest leads to you being able to purify them for food/drink or buffs. It's a load of wasted inventory space, but mostly everyone does it anyway. We're only concerned with her first quest. What's more important is talking about the furbolgs, since they guard the tunnel to Winterspring, and we will set foot there soon. However, they start off none-too-pleased with you. The Deadwood Village in the southwest should give you plenty to work with, and your level should make this area easy. After completing Timbermaw Ally, you will get a repeatable follow-up, so turn in the quest immediately, and then hang out here until you are out of hostile with Timbermaw. It shouldn't take much more than the first quest, which rewards 700 of the 1000 reputation you need. Sadly, there's no inn in Emerald Sanctuary, or a decent supply vendor, so our next trip out of town is going to be partially to get to some place that is, but fly back to Astranaar or Forest Song real quick if you need to for now. This trip will be considerably longer. Don't forget to be activating your pouch for the morrowgrain whenever it's available. Head for the Ruins of Constellas, which is in the western wall right where the road goes due north for the first time. The map area Ruins of Constellas is bigger that the actual ruins, so look around for a path up to the building on the map. Kill satyrs here to finish Corruption of the Jadefire. Watch out for stealthers. Because Xavathras is in the back, with lots of targets in the way, head directly for his area. Clear the area around him first just in case you need some room. Once he's dead, clear back toward the road, and you should have all the kills you need. On your way back out, stop at one of the ooze pools and open up the case containing the jars for A Little Ooze Goes a Long Way. Kill 6 Cursed Oozes and use a jar on their bodies. Continue north to Jaedenar. The cultists and adepts will be much harder to find than your other two targets. If you see one, focus on it, but don't rush too hard. It's probably best to stay topside and head to the back area since the barrow tends to have mobs in clumps. Once you finish, go back to the road, and ride north to Bloodvenom Falls. You'll find Tainted Oozes here, which you should treat the same way as the Cursed Oozes. A short distance north is Shatter Scar Vale, the site of Verifying the Corruption. Kill 2 of each fire elemental type. Step in the center of one of the craters, and then return back to the road. The reason it was important to get to at least Unfriendly with the Timbermaw was so they won't try to eat you with what we are doing next. From Talonbranch Glade, job back up to the road and take it the rest of the way to the end, and into Timbermaw Hold. There will be a fork partway through. Just keep going straight on through into Winterspring -- we have no need to be in Moonglade. As you exit, talk to the furbolg questgiver, and follow the road south. When it turns east, keep going south to Donova Snowden. Talk to the dwarf about Linken, and she'll reforge his sword and give you a new quest to see a guy in Feralas which we will not be doing. She will, however, have another quest, and there should be moonkin feathers in the area around her. You have a quest from Darnassus to collect 10 of those. Go northeast to Frostfire Hot Springs, where you will encounter the Winterfall Furbolgs. Kill what you can handle in this area -- you will find primarily Pathfinders, but you can complete the quest here. If you would prefer, cross the road to the southeast to Timbermaw Post and you will find more to work with there. Finish the quest for Donova and take the follow-up. You will NOT finish Winterfall Activity yet. Run back to Talonbranch Glade. 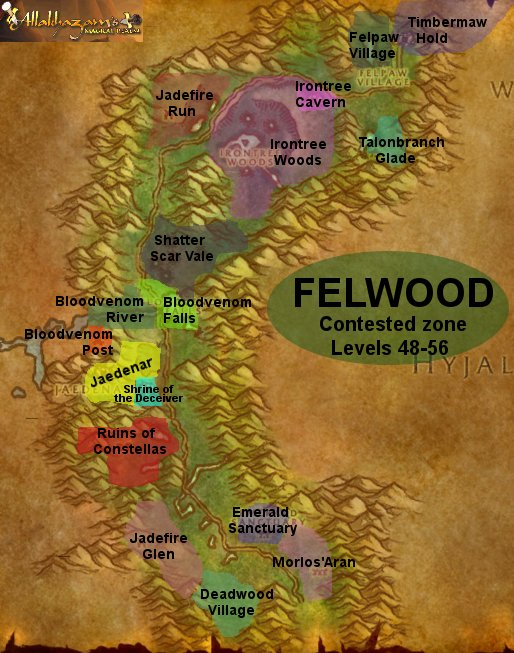 There is another furbolg village outside Timbermaw Hold on the Felwood side called Felpaw Village. Take Nafien's quest and head into the camp. Slaughter everything in your path, but in particular you want to reach the northwest corner of the camp where there will be a Winterfall Runner standing next to a cauldron. Clearing to the cauldron might not be easy, but it's your next objective. There are usually other people in the area that can help. Complete the quest for Nafien, as well as give him any excess feathers you have collected for faction, and then return to Donova to complete the quest. If by some chance you have managed to reach neutral with the furbolgs, you can complete the two totem quests, but chances are that you have not. If that's the case, just stick them in your bags to rot for a while. Catch a flight back to Emerald Sanctuary and complete the quests you've been sitting on. Follow-up time. Return to Jaedenar. Avoid the front building, taking the path behind it instead, until you reach a sludge-filled moonwell. Use the canteen to collect "water" from it, and then go back out to the road. Ride all the way to the northwest corner. In Jadefire Run, you will find more satyrs. When you enter, assuming you don't come in the back door, you should be able to go due left or off to the right. Go to the left, ignore the camps to either side for now, and go straight to the back. Around the corner will be another small camp that contains Xavaric. Clear around him, kill him, and take his flute, which starts another quest. The way you complete that quest is by killing satyrs. Guess what you were already going to be doing? Once you have your felbinds and all the kills you need for Further Corruption, cross the street and go into Irontree Woods. There are a lot of treants and corrupted ancients here, but your goal is the toxic elementals in the water. Kill enough of them to finish Toxic Horrors, and then return to Talonbranch Glade. Make the trip through Timbermaw Hold to Donova Snowden one last time. This is your last chance to grab moonkin feathers as well. Once you've concluded your affairs with her, continue down the road. When the road forks, go left. When it forks a second time, go left again. Soon after that should be a path to the left that will lead you into Starfall Village. Say hi, collect quests, and then head back out to the road. There is only one Winterspring quest we will actually concern ourselves with right now, since this zone is generally above our level. (In fact, it will be the last place we come before Outland.) Due south of where you are now is Lake Kel'theril. There are four patches at various spots around the lake that you can dig at with your new pickaxe. Each time you do, it will spawn two ghosts, so be prepared to handle two of the same mobs that are floating around the area. Get all four relic fragments, and then climb back onto the road somehow, and take the east road to Everlook. There are a few feeder quests in Everlook, and equally importantly there is a flight point. Fly back to Emerald Sanctuary to complete the quests you still need to hand in, and then travel (hearth) to Ironforge to turn in the ooze quest and get the follow-up. If we're going to finish those Un'goro quests, it's gotta be now. You've got one new quest for the zone as well, so may as well before it becomes obsolete. Fly to Stormwind first and finish the quest in the City Hall that leads to locating Ol' Emma in the canal district. Then continue down to Booty Bay and hop the boat to Ratchet. On your way to Marshal's Refuge, make sure you have each of the quests in the completed log (except A Little Help From My Friends.) Volcanic Activity is from Ratchet and Pawn Captures Queen is from Gadgetzan. Make sure you have the right quest items in your bags as well. Start with the hard part. Head inside The Slithering Scar in the south. Stay to the right as you enter, and you will reach the hatcheries in the back. Getting the scraping for Alien Ecology isn't a challenge, but Pawn Captures Queen will be. I seriously recommend you wait for respawn. Sit there until the room respawns, reclear it, and THEN kill the mobs nearby in the tunnel. This fight will take a while if you are alone, and you will not want to get rear-ended by new traffic, which is what usually happens. Head into Fire Plume Ridge. Finding the actual entrances to the upper ridges is not an easy task, but the hotspot that you really want to use the krakle-o-meter on is at the very top, just south of the large pool of lava. (Don't go near the cave up top, it's bad mojo.) From there, Ringo's hiding spot should be just below you, so hop down and sprinkle some water on him. Then lead him to Marshal's Refuge. Keep an eye on him -- he's not as bad as Shay from Feralas, but it's easy to lose sight of the fact that he passed out. Once you return to the refuge, turn in what quests you can, and ride out to Golakka Hot Springs to finish Finding the Source. Fly to Gadgetzan, then Ratchet, and finally return to Ironforge. We're done with Felwood. We're done with Un'goro. We WILL return to Winterspring, so keep those quests, but you can drop the rest. Our next target is the Plaguelands. Exchange your quest items at the bank as appropriate and fly to Chillwind Camp. This page last modified 2008-07-11 11:57:22.